Welcome to the Carlsbad Caverns National Park Information Page. Plane – Mesa Airlines offers passenger service between Carlsbad and Albuquerque. Major airlines serve Albuquerque, El Paso, Lubbock, and Midland, Texas. The closest major airport to Carlsbad is El Paso International Airport at 145 miles west of the park. The next closest airports are Lubbock Texas International at 178 miles northeast of the park, and Albuquerque International Airport is about 275 miles north of the park. Most of the major airlines fly into El Paso, Lubbock and Albuquerque and local airlines fly into Carlsbad, New Mexico. 1. Head to Highway 285 South and follow it to Highway 62/180 South to the park. 2. Take I-25 South to the Exit for San Antonio, NM and then take Highway 380 East to Roswell then take Highway 285 South to Highway 62/180 to the park. 1. Take I-40 East to I-25 South to the Exit for San Antonio, NM and then take Highway 380 East to Roswell then take Highway 285 South to Highway 62/180 South to the park. 2. Take I-40 East to Highway 285 South and follow it to Highway 62/180 South to the park. 3. Take I-10 East to I-25 South to El Paso, Texas then take Highway 62/180 East to the park. 1. Take I-40 West to Highway 285 South and follow it to Highway 62/180 South to the park. 2. Take I-40 West to I-25 South to the Exit for San Antonio, NM and then take Highway 380 East to Roswell then take Highway 285 South to Highway 62/180 South to the park. 1. Take I-10 East or West to Stateroad 54 North to Highway 62/180 North to the park. 2. Take I-10 East or West to Highway 285 North to Carlsbad and then take Highway 62/180 South to the park. Carlsbad Caverns National Park was first designated a National Monument on 25 Oct 1923. It was redesignated a National Park on 14 May 1930. Carlsbad Caverns was also designated a World Heritage Site on 06 Dec 1995. This park was established to preserve Carlsbad Cavern and numerous other caves within a Permian-age fossil reef. The park contains 83 separate caves, including the nation’s deepest limestone cave – 1,597 feet (486.8 m) – and third longest. Carlsbad Cavern, with one of the world’s largest underground chambers and countless formations, is also highly accessible, with a variety of tours offered year round. Carlsbad Caverns National Park is open year round. But the majority of park visitors come during the months of Jun, Jul and Aug and on weekends and holidays. The month with the least visitors is Jan. The park is open 24 hours a day, seven days a week, except Christmas Day. The visitor center and a large section of the self-guided Big Room tour are wheelchair-accessible. An outdoor nature trail and picnic sites near the visitor center and at Rattlesnake Springs, are also accessible. Access to the Big Room is provided by elevators located in the visitor center. The relatively level and well lighted trails make this the ideal tour for visitors with limited time or walking difficulties. The Big Room is accessible to wheelchairs, with a special map available at the visitor center information desk. Camping is by permit only. Free permits may be obtained at the visitor center. The permit must be returned to the visitor center or to any ranger at the completion of your trip. Camping is allowed in designated wilderness areas only. All campsites must be out of sight and sound of established roadways and must be a minimum of .25 mile away from any road or trail. If an area appears to have been used previously as a campsite please relocate to another area to reduce human impact in the backcountry. Backcountry caves can be hazardous. Entering caves without written permission of the superintendent is prohibited. Conditions for issuing permits vary according to the management classification of each cave. I recommend that you plan your trip and the areas you would like to see in the cavern or backcountry and then go and relax and make a day of it. Go and see all that is in the area and enjoy it. You spend more quality time and learn and see more than you could ever imagine. Camping is allowed in the backcountry with a free permit. Campfires are not permitted within the park. The use of charcoal, and any wood or plant material for fires is prohibited. Illegal charcoal and wood fires cause unacceptable impacts in the backcountry. Containerized fuel stoves may be used at campsites. A restaurant is located at the visitor center and a Lunchroom is located in the cavern by the elevator. You can always bring your own food as there are picnic areas. There are restaurants in the local communities listed above. There is no lodging in Carlsbad Cavern National Park other than backcountry camping. Pets are not allowed in the cavern. There is a kennel at the visitor center. There are three picnic areas in the park. Walnut Creek and near the visitor center there are picnic tables. Rattlesnake Springs has tables, grills, drinking water and restrooms. Join a National Park Service ranger to explore Carlsbad Caverns’s natural and cultural history. Join a ranger to learn about the forces that once shaped this landscape – and continue to do so, see the Calendar Page. Ranger / Naturalist programs include scheduled talks. Programs are provided by park naturalists year-round. These are just some of the ways to discover the diversity of the scenic, natural and historic wonders that comprise Carlsbad Caverns National Park. 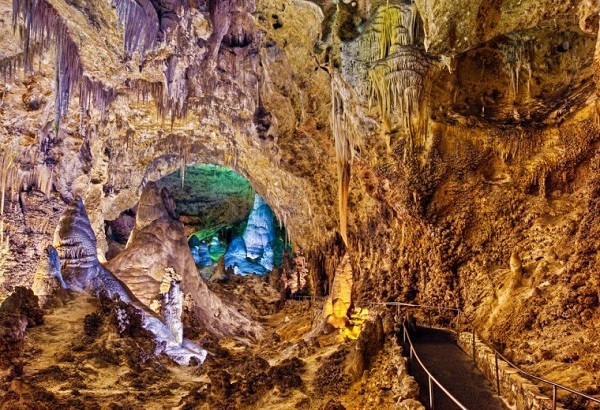 To ensure that your tour of Carlsbad Cavern is a comfortable, enjoyable and safe one, you are asked to follow some important rules and recommendations. Wear low-heeled, non-skid shoes for walking on the paved cave trails, which are sometimes steep and slippery. Use handrails where available. Take along a jacket or sweater to keep warm in the constant cool 56° F temperature of the cave. Stay on trails. Beyond the trails are steep drop offs where you could fall and injure yourself. There are also unlighted passages where you could get lost. Also, fragile formations on the floor, walls and ceiling can be damaged by persons straying from the trails. There is only one visitor center and it is open all year except for Christmas Day. In the visitor center there are exhibits on bats, geology, history, Lechuguilla Cave, books, brochures, topographic maps, exhibits (including a three dimensional model of Carlsbad Cavern), park activity schedules, information and cave tours as well as restrooms and water are all available. There is also a restaurant, gift shop and kennel available at the visitor center. Just outside the visitor center there are limited picnic facilities. The park’s climate is characterized by warm summers and mild winters. In the summer, average highs are in the 90°s F. In the winter the average highs are in the 50°s and 60°s F. Intense thunderstorms occur in the summer, posing the danger of lighting in higher areas and of flash floods in low lying areas. The cave climate is cool and varies little from the annual 56° F (13° C) average. A light jacket or sweater, and comfortable shoes with rubber soles for good traction are appropriate year-round.